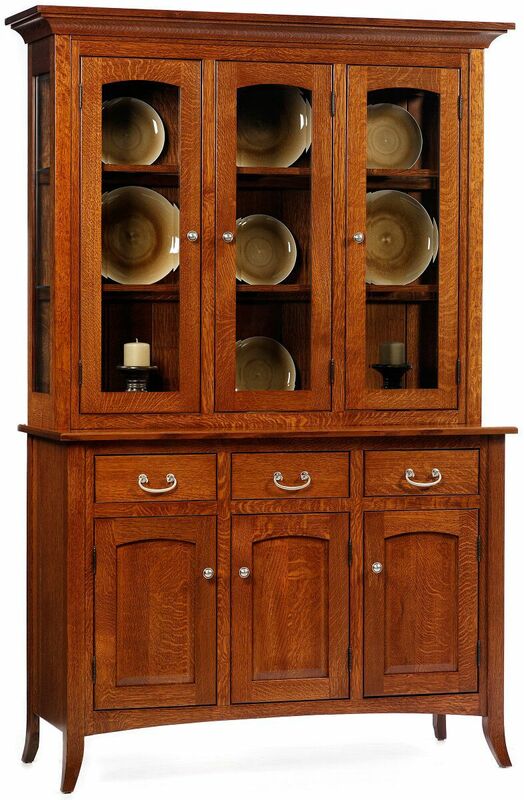 Made by hand, our South Hooksett 3-Door China Cabinet is a customized solid wood beauty perfect for your dining room, kitchen, or breakfast nook. Pictured in a Burnished Honey wood finish over Quartersawn White Oak, each South Hooksett China Cabinet is made-to-order. Three full length doors are adorned with arched beveled glass, and all glass shelves offer a plate groove and a real wood facing. Showcase your china using the recessed lighting system, and store essentials within the three dovetailed drawers or on the adjustable buffet shelves. Longevity in your fine furniture is guaranteed by the quality of the craftsman and materials put into it. Your South Hooksett China Cabinet is made only of responsibly harvested, American grown hardwoods. You choose the species and stain, and our Amish artisans will handcraft it into your one of a kind china display case.